A community council is calling on councillors to reconsider their decision to "significantly downsize" Meadowbank Stadium. Craigentinny/Meadowbank Community Council said the move was "completely at odds with what the public wanted". Under the plans, the 16,000 seater stadium will be replaced with a 5,000 capacity arena, and some of the land will be sold to housing developers. Edinburgh Council said maintaining the old arena would cost "vast amounts". Giacomo Modica, community council chairman, said: "It will mean the loss of almost two thirds of the existing facilities. We need more facilities, not less. "No community council has been contacted. Our last involvement was the series of summer workshops which produced a report that reflected only the chairman's view, not the view of the vast majority of its members." 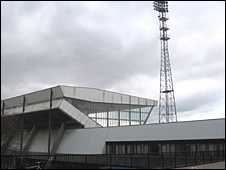 Deidre Brock, Edinburgh City Council's sports leader, said decisions on the future of sports facilities at Meadowbank "were not taken lightly". She added: "It is completely wrong to say that two-thirds of facilities will be lost as no decisions have been taken yet on the full range of facilities the new Meadowbank. "Maintaining the old Meadowbank would cost vast amounts and retaining the whole site would also leave a very large bill for the council tax payer. "Funds generated from the sale of part site will be re-invested in the brand new sports facilities that the city needs." She added that the council would go through a process of looking at how best to develop the site. Key sports organisations and local groups would be consulted about what facilities should be included in the plans. Money from the housing development will be used to help pay for the new £25m stadium, along with grants. Plans to build a new arena in Sighthill were shelved last year. On top of the £25m construction costs, it is thought about £5m would be spent on fitting out and developing the new centre.